I have several dear friends who have made the journey to obesity and back again, as have I. We could talk for hours and hours just about how we feel, our struggles, our triumphs. I will warn you, in our conversations regarding fitness, we liberally use the word "fat." My former fatties and I feel it is okay to use this term because we've been there. We know what we were. And it was fat. Five years of my life I qualified as "obese," although I rode the "overweight" roller coaster intermittently for an additional eight. One of the things I commonly express is, "Once you've been fat, there is a part of you that always feels like that insecure little fat girl inside." The challenges do not stop once the weight is gone, which I will blog about later. My heart will always go out to those struggling with a challenge I faced for thirteen years. 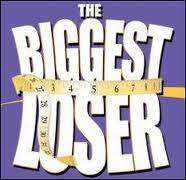 "Biggest Loser," really gets me. By "gets me," I mean, I do that really heavy breathing, short little sniffles, "I'm not gonna cry" business. I was never in as desperate a situation as these folks, but whether you need to lose ten pounds or a hundred pounds, there is still a lot of hard work involved...tears, sweat, digestive woes, roller coasters, stress, you name it. I know what it feels like. I know where they are headed. I ache for them. I rejoice for them. There is nothing in the world to describe the process emotionally and physically. Man, I'm doing the "I'm not gonna cry" business just writing this.